I totally spaced on October’s fitness goal. I didn’t have a particularly bad month, health-wise, it was just such a whirlwind that setting a new goal, sticking to it, and writing about it just didn’t happen. It didn’t help that I spent 12 days out of the country, 8 in Malaysia and 4 in Ireland, and that exercise while traveling is usually a take-what-you-can-get situation for me (20 minutes on the treadmill between meetings and team dinner? Sold!). But so far November looks quiet, and as we move into the season of holiday parties, big family meals, and shorter, colder, darker days, I want to be especially diligent about working out and eating right and finish the year out strong. I was originally going to do a sort-of-vague, sort-of-boring goal relating to increasing my number of weekly workouts. I do want to be sure that I’m working out frequently enough, as it’s so much harder to motivate myself to get out of bed for those early morning runs when it’s 40°, but I’m not as good as sticking to goals when they don’t excite me. Then last weekend while Trevor was out with friends, I found myself having one of those sort-of-secret mini-dance parties I tend to have when I’m home alone (just me? no?) and thought, what better way to ensure that I get into the habit of winter workouts than to dance more? So my goal for November is to get to at least 6 (hopefully more!) dance classes throughout the month. Not only is this goal a lot more fun than counting miles or sets of crunches, but I’m hoping that I find a few new classes to keep me energized during those icy weeks when outdoor exercise isn’t even an option. Of course, I’ll still be running throughout the month – 6 workouts in total certainly wouldn’t cut it – but I’ll be making dance class a priority. And let’s not forget the food! My diet these past few weeks has definitely been missing a fresh element. Again, the 8 days of delicious Malaysian curries and 4 days of potatoes and Guinness did not lend themselves to the most commendable eating habits. I came up with this rice bowl, which combines warm, comforting ingredients with fresh, bright ones to try and find a balance between the stick-to-your-ribs food I crave at this time of year and the need to continue consuming fruits and vegetables. I love roasted Brussels sprouts, and my favorite part are the leaves that fall to the side and get wonderfully crunchy and caramelized, so I sliced the brussels sprouts thinly to encourage that effect. 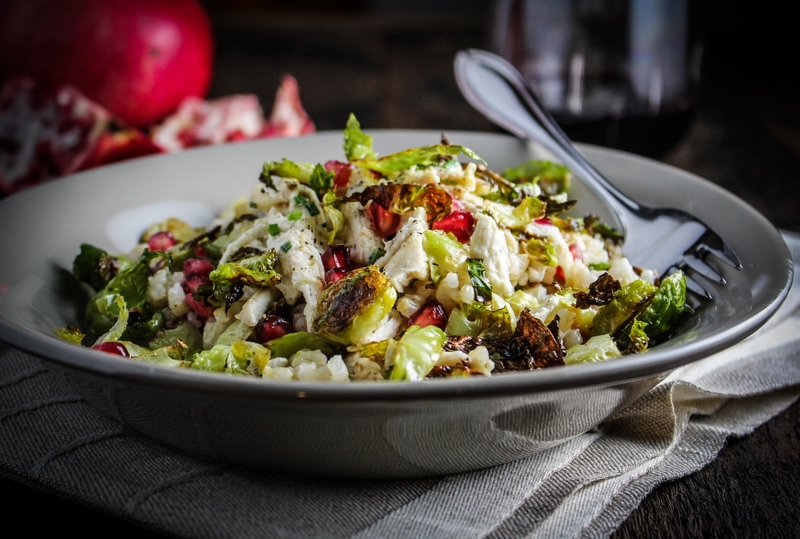 They combine wonderfully with the brown rice, a super simple lemon creme fraiche sauce that gets tossed with rotisserie chicken, and fresh pomegranate seeds for sweetness and crunch. It’s nothing earth-shattering in the creativity department, but it’s easy, flavorful, and nourishing, which is about as much as I can ask for in a healthy recipe at this time of year. Rinse the rice in cold water and drain well. Place the rice in a saucepan and add 3 cups of cold water and the butter. Bring to a simmer over medium heat, then reduce the heat to low, cover the pan, and simmer for 35-45 minutes, or until the rice has absorbed all the water and is tender. Remove from the heat and leave covered. Preheat the oven to 400°F. Remove the stems and outer leaves from the brussels sprouts and discard. Slice the trimmed brussels sprouts into round about 1/4 inch think and place the slices on a large rimmed baking sheet. Add any leaves that have fallen off to the pan as well. 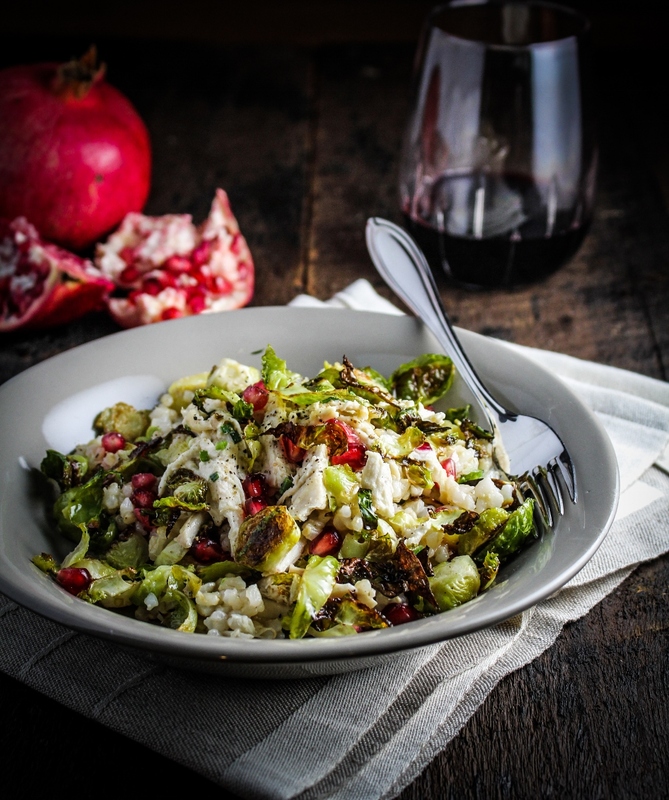 Drizzle the brussels sprouts with the olive oil, then sprinkle generously with sea salt and freshly ground black pepper and use a spatula to flip the sprouts so they are evenly coated with the mixture. Roast until golden brown and crispy on the edges, about 20-25 minutes, flipping once about halfway through. In a small bowl, whisk together the creme fraiche, lemon juice, black pepper, and chives until evenly combined. Season to taste with sea salt. If your rotisserie chicken is still warm, simply toss the creme fraiche sauce with the chicken to thoroughly coat. If the chicken is cold, reheat the chicken in the microwave or on the stovetop, and then toss with the sauce. 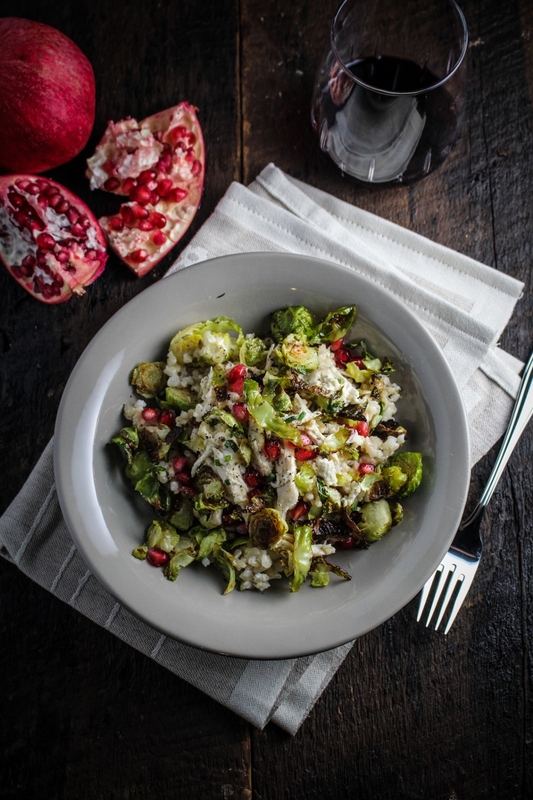 Mix together the rice, chicken, roasted brussels sprouts, and fresh pomegranate seeds. Serve warm. This looks wonderful and so tasty! I love the colours! 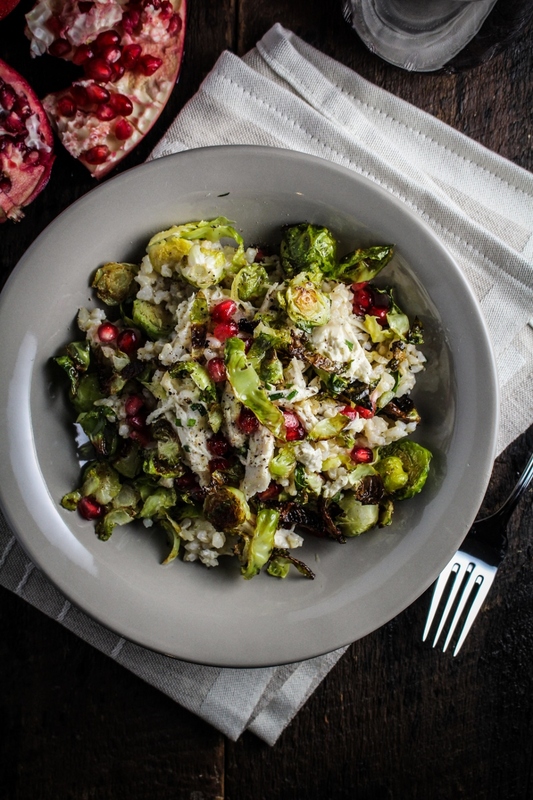 I love love love Brussels sprouts – also, the styling in these photos is just lovely. Great job! Oh this looks so yummy and I don’t even eat chicken! I’m going to try it with some tofu, I think it will be perfect. This looks delicious, and has reminded me that I need to cook with brown rice more often! Love!! Yum! I made this tonight and it was so good! I didn’t have creme fraiche, so I just used sour cream instead and still thought it was delicious. Thanks! I made another batch last night as well! The second time around I stirred in some mustard instead of lemon. So glad you enjoyed it!